Popular data processing platforms offer users the ability to inject an external process into the data processing pipeline. The data flowing through the data pipeline is fed as input to the external process, while the output produced by the process is fed back into the pipeline. The external process runs an executable or a script. This pattern resembles the popular Unix pipelines (or pipes). This feature is usually found under the name of Streaming. 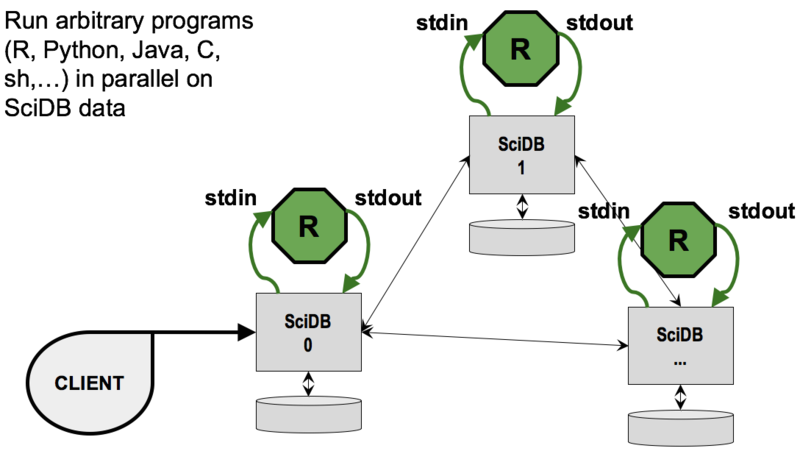 The input and output data can be in the form of Pandas DataFrames in Python and R DataFrames in R. Internally the data is transferred using Apache Arrow for Python and native format for R.
The following diagram provides the intuition of how streaming works in SciDB. Notice the green octagons marked with R. They represent the external processes injected into the data pipeline. Data gets transferred to and from them using stdin and stdout respectively. There are as many instances of the external process as there are SciDB instances. In this post, we explore a few useful patterns of interacting with the SciDB Stream plug-in from Python. As an example, we use the Python scikit-learn machine-learning library and build a model for the Digit Recognizer data-science competition offered by Kaggle. The dataset used in this competition is the Modified National Institute of Standards and Technology (MNIST) handwritten image dataset. First, we need to install the stream plug-in for SciDB. Installation instructions are available as part of the plug-in README.md file. The Apache Arrow library is also installed at this point. We also use the accelerated_io_tools plug-in for loading the data into SciDB. See here for the installation instructions. (The accelerated_io_tools plug-in was discussed in more detail in an earlier post.) Finally, we install the limit plug-in for its ability limiting the output results. A Docker image file of SciDB and all these plug-ins is available here. SciPy: Fundamental library for scientific computing in Python (only necessary on the server side). Next, we need to download the train and test datasets offered by Kaggle as part of the Digit Recognizer data-science competition. Downloading the datasets might require creating an account on the Kaggle website. The datasets need to be copied onto SciDB instance 0. As intended, the first attribute a0 contains the record label (0, 1, 2, etc.) while the error attribute contains the pixel color intensities (e.g., 0,0,0,..., etc.). Use the stream operator to apply the mapping function to each record in the train_csv array. Store the result in the train_bin array. The mapping function takes as input a DataFrame with a chunk of records from the train_csv array. The function uses the pandas.Series.map function, which applies a map function to a DataFrame column. It first converts the label value, in the a0 column, from string to integer. It then converts the pixel color intensities, in the error column, from string to binary. The lambda function provided parses the pixel color intensities and stores the result into a NumPy array. The binary representation of the NumPy array is stored back into the DataFrame. The mapping function is serialized using the pack_func function provided by the SciDBStrm library (see docs) and uploaded to a temporary array in SciDB. This array will be removed by the SciDB-Py library when the Python interpreter exits. As before, the stream mapping function leverages the pandas.Series.map function. The function provided to pandas.Series.map converts the binary value stored in the img column to a NumPy array and applies the black and white thresholding. The binary representation of the modified NumPy array is stored back into the DataFrame. python_run = """'python -uc "
We want to provide both a map and a finalize function. The map function is called for each chunk. The finalize function is called once all the chunks have been processed. The map function uses the pandas.Series.map function to convert the values in the img column from binary to NumPy. We then use the NumPy array (reshaped as a matrix) and the label column to train a partial model. We also keep track of how many records we used to train. The map function does not return any data back to SciDB. The finalize function first checks whether any training data was fed into the model. Remember that this code runs independently on each SciDB instance and some instances might have no training data. If training data was provided, the model is serialized using the dump function (see docs) and returned to SciDB along with the training records count. Our setup consists of two SciDB instances and each had approximately 50% of the training data. As a result, two models have been trained in parallel, one on each instance. We use the standard pattern of providing a mapping function, called merge_models. In this function, we first deserialize the instance models. We also prepare a label encoder with 10 labels, one for each digit. Once we have this, we can instantiate the voting classifier and set its estimators and label encoder. The classifier is then serialized and returned to SciDB along with a total count of the training records. We define a “mapping” class in order to have a static class variable for storing the trained model (instantiated during streaming). The class provides a transformation function (csv_to_bw) to convert a test record from text format to NumPy and to apply the black and white thresholding. (These transformations are identical with the one used for the training data earlier.) The actual map function first applies the transformation function for each record of the input DataFrame. Next, it predicts the labels for each of the images in the input DataFrame (after first reshaping the input DataFrame to a matrix). The labeled data is returned to SciDB. In order to have both the “mapping” class we just defined and the model trained earlier available in the stream operator, we store both of them, as two attributes in a record in a temporary array. This temporary array is fed into the stream operator as the second argument array (using the _sg operator). The resulting file, results.csv, can be directly uploaded to Kaggle for scoring. We also made predictions for the training data. We plotted the true labels and the predicted labels on a scatter plot. We randomly jittered each point so that they do not completely overlap. Store and retrieve serialized machine-learning models in SciDB. The code discussed here is available as a single script as part of the SciDBStrm Python package. A Docker image file of SciDB and required plug-ins for running this script is available here. © Copyright 2016-2018 Rares Vernica. All rights reserved.